Testing is nothing but a process of validating and evaluating a system and its component(s) with an intent to check whether it is going to satisfy the functional specified requirements or not. Testing is about running/executing a system in an intent to find any errors, gaps, or any other missing requirements in contrary to the actual given requirements. 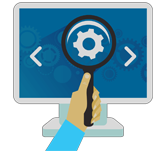 This section on Software Testing will give the learners the basic understanding on software testing, its types, methods, levels, and other related terminologies. This chapter is specially designed for the QA professionals who are willing to understand the Testing Framework in details along with its methods, types and levels. This chapter will provide basic knowledge to start with the software testing process from where we can take ourselves to basic to higher levels of expertise. Before moving on with this chapter, we should be having a basic knowledge of the SDLC process. In addition, we should be having a basic understanding of software programming using any programming language.